Learn how to handle your flooded pool after extreme rain during the rainy season. After a major storm, your pool will likely need some repairs to get it back to working condition. Heavy rains lead to flooded pools which results in unbalanced chemicals, contaminated water, and problems with the equipment. Continue reading to learn how to fix your flooded pool to be prepared during the rainy season. After heavy rains and floods, your pool may be contaminated with chemicals, oils, debris, and more. It’s crucial to keep everyone, including pets, away from the water until it is properly cleaned. If your pool water is murky, it’s even more dangerous, as there is limited visibility as to what is happening underwater. It’s crucial to get your pool back in working order as quickly and safely as possible so the problem does not get worse. Make sure your pool equipment is running as well as that the skimmer and pump baskets are clean of debris to allow the water to circulate properly. 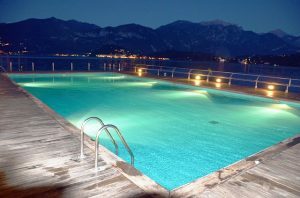 Balancing and shocking the pool to clear and maintain chlorine residual will also be necessary. You will find that you will need to clean the filters more often when the pool is dirty. If your pool chemicals were stored outside and got wet or contaminated, they can be potentially dangerous and cause chemical reactions. If you have pool chemical concerns, call your local fire department or the emergency call center CHEMTREC (1-800-424-9300) for assistance. If possible, be sure to store your pool and hot tub chemicals in a safe, cool, dry location before expected storms. Incompatible chemicals such as chlorine products and acids should be separated far apart, while liquid chemicals should be kept closest to the floor to avoid leakage or accidental mixing. When possible, keep an eye on the water level of the pool as it rains. If the water level reaches the top of the skimmer mouth, the pool will not be able to properly pull water to run the equipment. A submersible pump may be used to pump water out. If you can waste water from your pool equipment, that is another way to take the required amount of water out. Always remember that if there is lightning or thunder, you do not want to touch anything near the pool. Before attempting to do any clean up after a storm, it’s critical to turn off the power to all pool and spa equipment at the main circuit breaker. Electrocution accounts for many deaths and injuries after a major storm, so it’s crucial to take safety precautions seriously. Working with electrical equipment is dangerous to do on your own, and requires a licensed electrician to perform any repair work. This entry was posted on Monday, July 9th, 2018 at 10:40 am. Both comments and pings are currently closed.